The choice of Team Sky offers aerodynamics, ventilation and comfort in a smart looking package. In a market saturated with choice, choosing a cycling helmet is no easy task. Since the UCI made helmets compulsory in 2003, replacing the leather hairnets and casquettes that came before them, the number of helmets on the market has exploded. Today there are hundreds to choose from, but why settle for second best when you can have the best. That's why Bespoke Cycling is proud to stock the Kask Protone, the helmet of choice for the most successful professional cycling team in recent years, Team Sky. Helmets have gone beyond being merely just safety products. Of course safety is the first and last main job of a helmet, it's the principle reason for wearing one, but they've taken on so many other considerations over the years. They've gotten lighter, better ventilated and more comfortable. Better looking too. But the most recent development has been a push towards improved aerodynamics, for aero is the biggest driving force in top level cycling right now. Reducing drag is of course desirable but the challenge in producing an aero helmet is ensuring comfort, ventilation, and weight aren't compromised in the pursuit of low drag. Early aero helmets might have produced good results in a wind-tunnel but left us sweaty and overheating on the road. This is where the Protone hits the sweet spot, balancing all those requirements whilst being more aerodynamic than a regular helmet. Aerodynamic design has informed every aspect of the Protone. 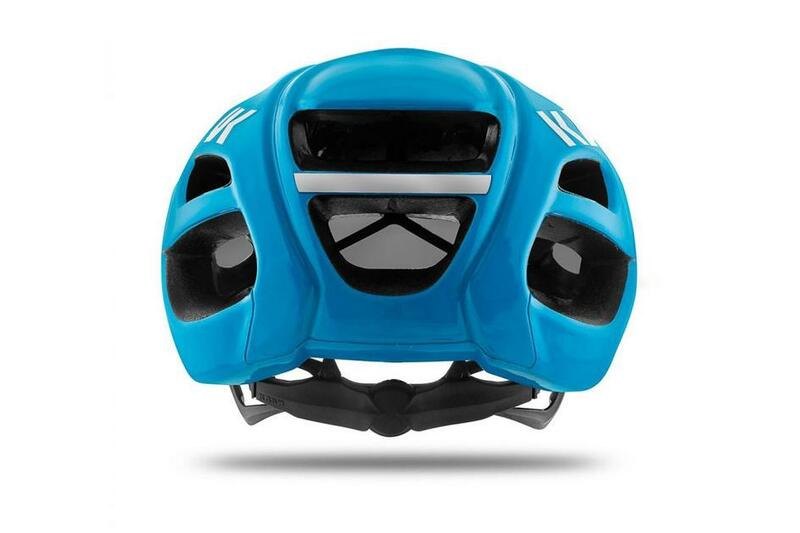 Kask worked with Team Sky to develop the Protone, utilising computational fluid dynamics modelling software backed up with wind-tunnel testing and thermodynamic analysis to ensure that every curve and vent was designed to massage airflow over its surface. From the front it looks like a conventional vented helmet with its massive openings, but around the back it's smooth and rounded, to manage the airflow as it runs over the helmet. The result of this development is that Kask claims it has the lowest drag coefficient of any ventilated helmet and is also the best at dissipating heat as well. Whilst being slippery in a wind-tunnel is undoubtedly a good thing, Kask has sought to develop a helmet that is fast in the real-world and through a wide range of head positions. Kask took into account the riders' posture on the bike and accounted the for the many variances in rider position. So whether you've got your head down in the drops, staring at the stem doing your best Froomey impression, or riding along on the tops, the Protone is designed to be aerodynamic. 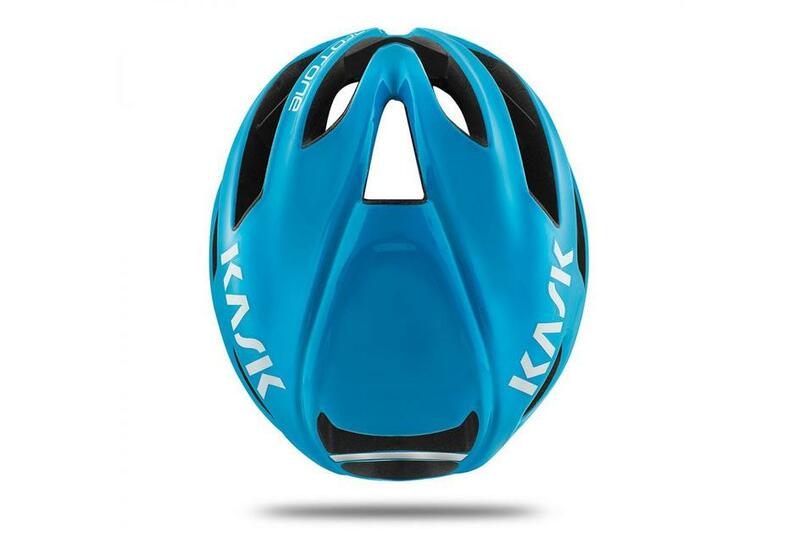 Kask has even considered the drag consequence of slotting eyewear upside-down into the front vents of the helmet. That's attention to detail. Some aero helmets can leave you in a hot sweaty mess the moment the mercury or gradient shoots up. 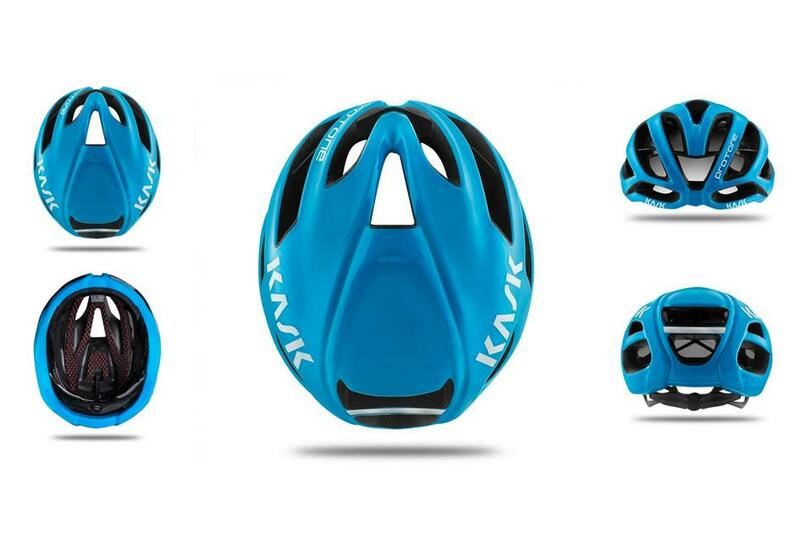 Kask has produced a helmet that doesn't compromise ventilation in the pursuit of aerodynamics. We've tested it over hours of riding in different climates and scenarios, and can confidently say it keeps you cooler than most other aero helmets. At high speeds the large front vents noticeably pull in buckets of cooling air to reduce heat buildup, making it a great choice for road racing. During long mountain climbs we noticed less heat buildup wearing the Protone than other helmets too, ideal for tackling the Marmotte or L'Etape du Tour. It's all very well having the lightest, most aerodynamically efficient and highly ventilated helmet if it isn't comfortable. 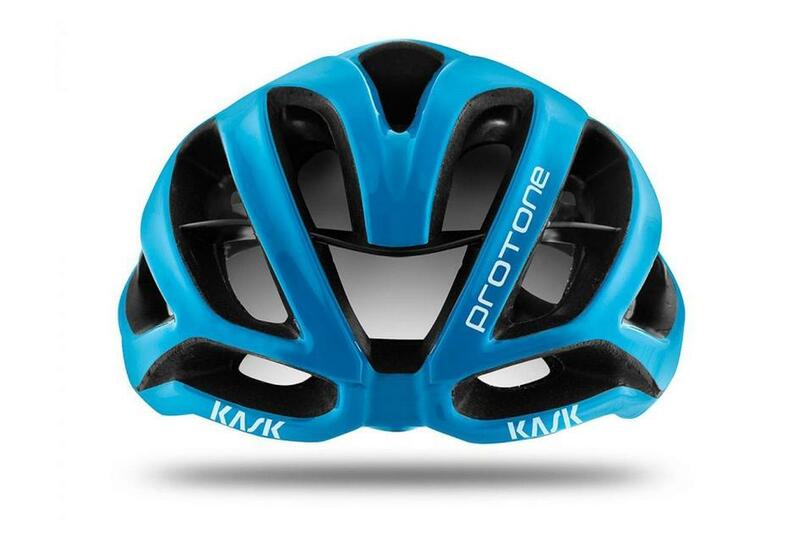 Fortunately, Kask ensured the comfort of the Protone is equal to its performance in other departments. The result, it's one of the most comfortable helmets we've used. The comfort is aided by generously cushioned pads where the helmet contacts the scalp. The retention system (Octo Fit Kask calls it) is smartly designed and can be adjusted vertically which means you can get the two large cradling brackets to comfortably snug the back of your head. A small rotary dial permits easy adjustment on the move but I found the fit of the helmet so good and the retention system well placed so only a few turns of the dial were needed to keep the helmet from moving about. The side straps continue the comfort theme. They're thin and narrow and soft next to the skin, and a synthetic leather chin strap ups the comfort furthermore. We like that the buckle is positioned off-centre alongside your face rather than right under your chin. There's no irritation from straps when you're 6-hours into a sweaty gruelling ride. The Protone does the best job of virtually disappearing once you've clipped it into place. Ensuring it's a suitable helmet for everyday use, the padding can be easily removed and washed. 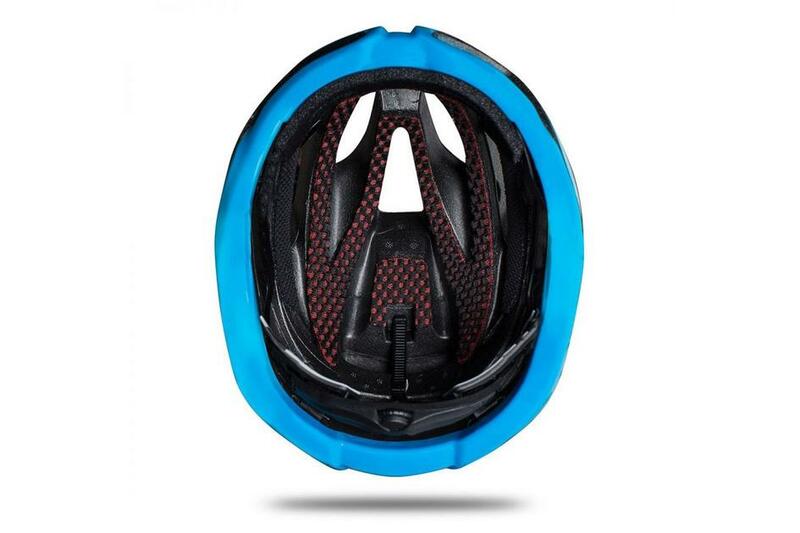 So the Protone combines impressive aerodynamics, excellent ventilation and high comfort into a helmet that is sleek and stylish. Even without Team Sky's endorsement, it's a top level helmet that we're happy to wear on a daily basis. The Kask Protone is available at all Bespoke stores and is a firm staff favourite. Please contact us for further details.